With Winter fast approaching, it can be reassuring to have a few extra security measures in place before the dark nights descend upon us. Check out our top tips on the best way to improve your home security and deter any unwanted visitors from your property! It is important to ensure that you fit a secure door lock onto all external doors on your property. This includes any concealed doors such as a front door that sits behind a porch, or the door leading from your house into your garage. Typically, the minimum requirement for an external door is a certified 5-lever mortice lock. Where possible it is best to also install locks on windows too to improve security. External security lights are a great feature during the Winter months, as the light is activated upon movement being sensed, therefore enabling you to see clearly who is approaching your property when it’s dark outside. This can not only help put your mind to rest when the neighbours cat is leisurely strolling across your lawn, but also prove to be a powerful deterrent to any unwanted visitors. 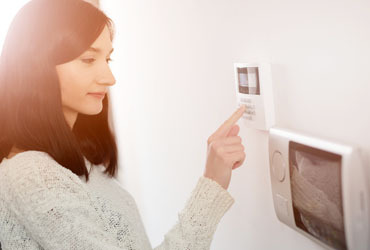 Home alarm systems are a fantastic deterrent for burglars, as on a basic level they quickly sound the alarm to alert the whole street of a potential issue. It should also prompt any potential intruders to vacate your home quickly. Some alarm systems can also be monitored by a response centre who decide if an activation is passed to the police. If you do choose to have your alarm monitored in this way however, it is worth noting that you may be required to make regular maintenance payments to ensure this service is upheld. Home CCTV surveillance systems are widely available on the market and can be installed both inside and outside your property. This is an ingenious way to self-monitor your property if you are away from home, or even if you simply want to check who is at your door without getting up from your chair! Carefully consider your requirements as some systems enable you to vocally interact with visitors even if you are away from home and you can often choose to upgrade your plan to enable historical surveillance data to be stored. For more ideas on how to prepare your home for Winter, why not check out our previous blogs on Preparing Your Home for Winter and 5 Ways to Refresh Your Room?